What’s better than discussing a book with your girlfriends? Discussing a book with your girlfriends AND the author! Meep! Joining us on Modern Bliss today is Dawn Rae Miller, debut author of Larkstorm. The MB ladies read. They asked. And Dawn answered. Stay tuned through the end of the interview for information on ANOTHER fabulous giveaway. MB: How did you come up with the idea for Larkstorm? DRM: I read The Hunger Games and my mind was blown. I wanted to write a main female character who had inner strength and didn’t need a boy to save her, but was feminine. Lark developed fairly quickly after that. MB: The premise to the story is pretty unique, even with all of the YA dystopian books out there right now. Will we get some more details on the world Lark lives in and a deeper look at the way their society is organized (the whens and whys)? DRM: Absolutely. The bulk of Book 2 takes place in San Francisco – the heart of the State. I’m working on adding atmospheric details right now – technology, social roles, the relentless media. I also want to dive deeper into Caitlin’s story especially since Lark is worried about becoming like her. MB: Have you always been interested in fantasy and the supernatural? DRM: Until recently, I mostly read fantasy and dystopian novels. I read for escapism. I want to visit different worlds and lose myself in a book. MB: What was the hardest part to write? What was the easiest? DRM: The hardest was definitely figuring out what caused the two groups to split after the Long Winter and the Channing family history. I went through several different iterations before coming up with what’s in the book. The easiest scenes were any that had Lark and Beck together. I love writing the two of them and my fingers couldn’t keep up with my thoughts. MB: I’m always interested in the thought process behind elements of certain books. Did the song Allouette come first or the name Lark? DRM: Lark had her name for twelve months before Allouette came into play. I had received a revise and resubmit request from a major publishing house and had a phone conversation with one of their editors. She wanted the Splinter group to be creepier and Eamon less stereo-typically villain-ish. My family speaks French, so I understood the lyrics to Allouette. It seemed like the perfect fit. (If you haven’t watched the Larkstorm book trailer yet, my step-father made an arrangement of Allouette for it that’s haunting and creepy). MB: Which of your characters is your favorite? DRM: I like Malin. There’s more to her than Lark knows. MB: Did you cry at the end like many readers did/will? DRM: Is it lame to say yes? I cry every time. I actually wrote the end before many of the interior scenes, so I knew what was coming but it still made me tear up. MB: I’m dying to know what happens… do you already know how the [trilogy] is going to end? DRM: I have a detailed outline for book 2 and a short outline for book 3. I do know where the story is headed, but I won’t know all the specifics until I actually sit down to write the books. MB: When do books two and three come out? DRM: Book 2 is scheduled for June 6, 2012 and Book 3 is set for December 2012. However, I have a ghost writing job that takes precedence and book 2 may get shifted back by a month. I’m still aiming for June, but it depends on how focused I am the next 3 weeks. MB: Do you know the title for Book 2 yet? MB: Which comes first, the character’s story or the idea for the novel? DRM: In this case, Lark formed first and the story grew from there. MB: Who designed the cover of the book? DRM: I came up with the initial idea of a girl surrounded by birds but Sarah Marino, the illustrator, took it to a whole new level. MB: Have you always wanted to be an author, or did you fall into writing later in life? DRM: I can’t say I’ve always wanted to be an author. I liked the idea of writing, but didn’t really think it was a feasible career choice. It wasn’t until two years ago that I decided to go for it. MB: When and why did you begin writing? DRM: Larkstorm is the first book I’ve ever written and I started it at the end of January, 2010. The idea to write a book came from an acquaintance who was an aspiring YA author. I figured if she could do it, so could I. Before that, I’d written for my high school and college newspapers and had dreams of being an editor at Vogue. MB: Why write YA (young adult)? DRM: The simple answer: I love the hope and optimism of teens. All too often, I pick up an adult book and don’t finish. I don’t want to read about middle-aged men having a crisis, or dead children, or mortgage problems. I want to remember what it’s like to believe anything is possible. I want to remember the flutters of a first kiss and how something as simple as the way someone says your name holds all the secrets of the universe. YA is also extremely diverse. In addition to Larkstorm, I ghost write a commercial YA contemporary series. It’s nothing like Larkstorm. I feel like writing YA gives me more opportunities to expand my writing abilities. MB: Is there anything you find particularly challenging in your writing? DRM: Description. I have a tendency to not describe settings and have to go back and re-do those scenes. MB: If you had to choose, which writer would you consider a mentor? DRM: I’m fortunate that I’m friends with several published and soon-to-be published authors. It wouldn’t be fair to choose one of them over the others because each one has provided me with invaluable advice and handholding. I thank them all in my acknowledgements. MB: Do you have any advice for other people who are trying to break into the writing industry? DRM: Be prepared for rejection – it happens at every level: agents reject authors, editors reject agent pitches, editorial boards reject editors. It’s brutal. BUT the most successful people are those who don’t give up. I’d wager 98% of breaking in is determination and luck. MB: Can you talk a little about the process of writing while also taking care of your family? DRM: I neglect them all! Just kidding…kind of. When I’m on deadline, I will write for 8-10 hours a day easily. My husband is in charge of everything during those times because if I’m in a groove, I don’t want to break concentration. But the rest of the time, I try to write from 7-11 every night. I home school my oldest son in the mornings and my youngest boy gets home from preschool at 11:30. Sometimes, I can squeeze in work before we have to pick up my middle son at 2:45. Then it’s off to sports practice, games, etc. Luckily, my boys go to bed at 7pm (Yes – even the 10 year old). MB: What have been the biggest challenges of writing with small children in the house? DRM: Mommy guilt. When I have to spend time working while they’re awake or home or want me to play with them, I feel terrible. MB: Can you describe how it felt when the book went live? Was it surreal to have your hard work and dedication available to the world to read? DRM: I won’t lie, I had an anxiety attack a few days before. The book had been read by so many industry people by that point, but still…readers were going to be able to buy it. That frightened me. Would anyone other than my family buy it? Would it languish at the bottom of the Amazon pile? Would the reviews be scathing? Or worse – would no one review it? A little known fact is that most debut books sell less than 1000 copies. Many debut authors disappear after their first books. I don’t want that to happen, but I have an uphill battle because I don’t have the marketing machine of a Big 6 publisher behind me. I’m doing all my own marketing. So if Larkstorm flops, it’s 100% on me. But oddly, on the night of the 5th, I went to bed early, woke up around 2am, saw Larkstorm was up on Amazon, and went back to sleep. At that point, there was nothing else I could do – no more changes or edits. It was done and I had to live with it. And I felt extremely calm about it. The most rewarding thing about the whole experience has been my ten-year-old son telling me how proud he is of me. As a mom, nothing means more to me then that – not even fantastic first day sales or making a list. In addition to writing her own books, Dawn is the ghostwriter of a commercial YA series. She also spends too much time on Twitter. So much, in fact, her agent wonders how she actually finishes things. (Answer: She never sleeps.). Dawn lives in San Francisco with her husband and three sons. I want to thank Dawn for visiting and answering our questions. I think I can speak for all of us when I say–we can’t wait to read Book 2! Larkstorm is available on Amazon, Barnes & Noble, and Smashwords. And–super exciting–Larkstorm will be available in paperback later this week. This GORGEOUS handmade eReader cover from CW Creations on Etsy. The design is so fitting for Larkstorm, it’s almost like it was made for the book. And while that’s not the case (but seriously, it’s like fate), it will be made just for YOU and whichever type of eReader you happen to own. Be sure to leave a separate comment for each entry. Contest deadline is 11:59pm on 12/21/2011 CST. Contest winner will be posted and contacted on 12/22/2011. If you are not a member of Modern Bliss, please leave an email address (or other form of contact) so we can notify you if you win. After reading the interview I added Larkstorm to my to-read list on Goodreads. 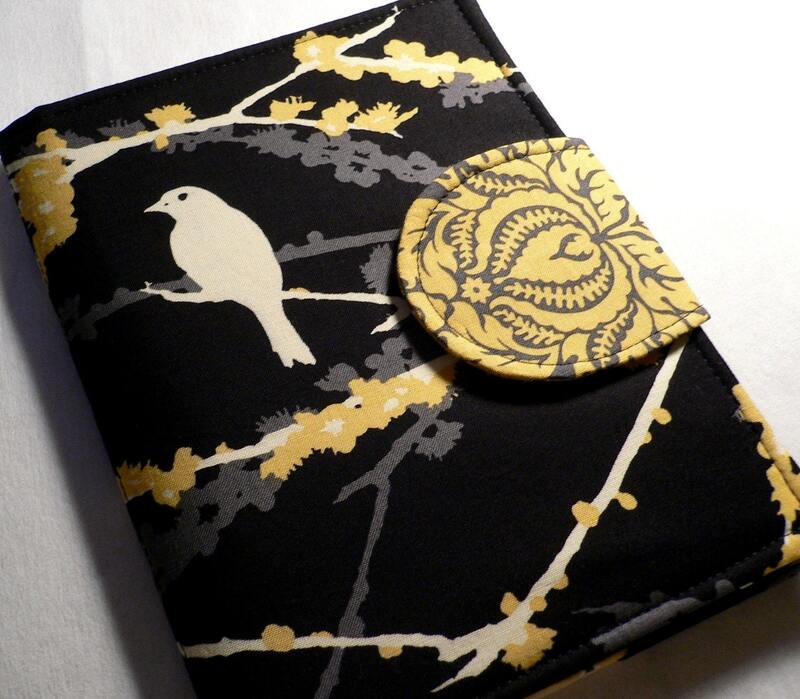 I would love to win the e-reader cover! I asked a question of the author! Love the interview. This book is definitely on my list of books to read after the first of the year. I just got finished downloading Larkstorm on my nook as I am typing this. Can’t wait to read it. Posted on facebook about it! Wow, that cover is GORGEOUS! Totally fitting for the book! Great interview. Cannot wait to read the book! I love where she talks about why she chose to write YA. I completely agree they take you to a place where you lose real life and can’t put the book down. I’m really looking forward to reading this trilogy! I cannot wait to read this!! This was such a fun interview!! I can’t wait to get my hands on a pb copy of Larkstorm! Im finishing the book now and it’s so hard to put down! Comment is for Haley who submitted an interview question. There are many versions of the apocalypse. Post-nuclear, post-asteroid, post-zombie, post-Ice-Age, post-vampire – the world has ended so many times that it’s sometimes difficult to tell the different occasions apart. Larkstorm offers something a little different. It’s certainly post-apocalyptic, but things are unusually utopian.Lark Greene is a girl living a happy life under the State’s rule. She has everything she wants: a place to live, education, and of course her friend Beck, with whom the State has paired her since birth. There is always the danger of Sensitives, those mysterious people who caused the end of the world decades ago, but the State keeps them separated from regular people. But close to her 18th birthday, Lark discovers that nothing is as it seems. Lies are everywhere, and Lark begins a journey to find out the truth.Larkstorm combines elements from dystopia, fantasy, and romance genres while changing things up enough so that everything feels fresh. Some of the plot twists are fairly evident from early on, but overall this is a book that will keep you entertained.As a guy, there’s one major complaint. There is a lot of focus on “girly” details – especially in the early chapters, with long paragraphs describing what Lark is wearing and why she chose this piece of clothing, fashion, and colors. I don’t find that kind of description very interesting or important. These parts feel almost shoehorned in, to try and reach out to a bigger audience. Once you get past these initial scenes though the book picks up pace.This is a good book for young-adult readers – the Hunger Games and Harry Potter age group. It’s certainly not high fiction but Larkstorm is great if you’re in the mood for an adventure.